Put the shallots, wine and vinegar in a small pan over a low heat. Simmer for 10 minutes or until reduced to 1 tbsp of liquid. Set aside. Take two large sheets of foil and brush the centre of each with the olive oil. Put one bass on each sheet. Combine the melted butter and lemon juice. Rub half this mixture over both fish, then spoon the remainder into their cavities. Lightly season. 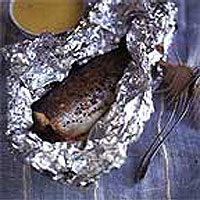 Bring the foil up over the fish and crumple the edges to make baggy but airtight parcels. Put on a baking sheet. Bake in the centre of the oven for 15 minutes. When the fish is cooked, open the parcels. Remove the skin by cutting through it above the tail then peeling it off. Turn the fish over and repeat the process. Re-wrap and keep warm while you finish the sauce. When ready to serve, gently reheat the wine mix until warm, not hot. Over a gentle heat, briskly whisk in the butter, a piece at a time, so it forms an emulsion. Continue until all the butter is used and you have a thinnish sauce. Take off the heat and season. To serve, lift the first fillet from each fish, pull away the spine and remove the second fillet beneath. Serve with the beurre blanc and new potatoes.